Have you encountered this error message: “Rats! 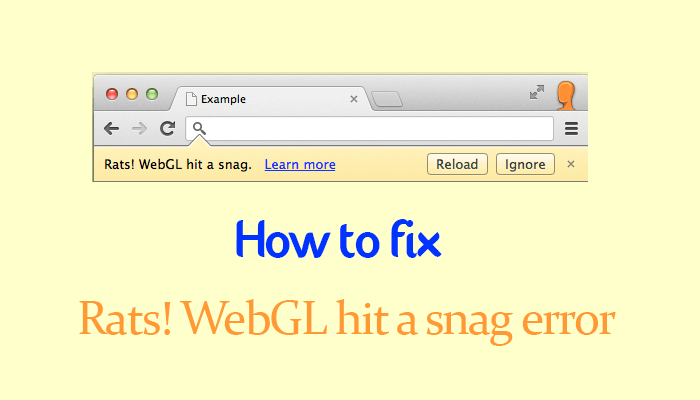 WebGL hit a snag.” This problem is usually encountered by people who use heavy scripts. Very common with Chrome browsers. However, this does not in any way erase the fact that Chrome browser is one of the best browsers anyone can use, so there is actually no need to run off, cause there is a way to fix this problem and go ahead to enjoy your browser. What is WebGL hit a snag? Most times when this error pops up, the first thing that usually comes to mind is that you have been attacked by a virus, but that is not the case. This has nothing to do with a virus or any other malware attack, it does not in any way signify any breach in the security of your computer. This problem is very common with chrome browser. It happens when you are trying to use the browser to access a web graphics library or WebGL content that is not compatible with the browser or if there is an error with the WebGL. Most try to solve this problem by refreshing the page they are on or even restarting their browser or the computer as a whole, sorry to disappoint you, but none of these actions will solve the problem. However, getting this error message will not stop the browser, but it can very annoying and stressful work with your computer while this error message keeps popping up. Nevertheless, here is a sure and easy way to fix this problem. Click on the three dots on the right-hand corner of your browser. This action will bring out a drop-down menu. Down below under the system section, you will see “Use Hardware Acceleration whenever possible” option, uncheck it. Restart the browser. This should fix the problem, but if it doesn’t, then try the next method. Note: This method might make you encounter some hitches when trying to watch online video or browsing heavy websites. Open a new search bar or you can call it a new tap and type in chrome://flags. The above action will lead you to Disable WebGL option. Enable ” Disable WebGL” option. Restart your browser to effect the changes you just made. Click on the three dots on the right-hand corner of your browser, and follow the drop-down menu. Down below you will see a section named “Reset and clean up” click on Restore settings to their original defaults. Scroll down and you find a heading titled “Problems Detected”. You see those warnings highlighted with red? therein lies the reason for the malfunctioning of the WebGL libraries. If you are using chrome on your Android device, you might still encounter this same problem. Fixing it follow a somehow similar procedure. Uncheck browsing history if you don’t want to wipe it off and also uncheck cookies and site data. There are so many other ways one can fix this problem in Android, but the above step is sure to fix it in Android. You can also try updating your browser from Google play store or you can uninstall the app and install it back. I’m sure it will be fine. Getting this error while browsing online can be so inconveniencing and most time users don’t know what to do, but with these steps, you are sure to do it on your own without seeking for any help. However to always stay safe and avoid the inconveniences associated with this, always make sure your browser, drivers, Windows, and antivirus are updated to the latest versions.